A Santa Cruz police officer contacts an apparently homeless man sheltered from the rain in a commercial doorway in downtown Santa Cruz. The Santa Cruz Police Department is launching a new partnership to connect homeless vets directly with the Veterans Resource Center Services. SANTA CRUZ -- When Sylbia Blan first attended Project Homeless Connect four years ago, she was desperate for a job and medical services. Now that she's working for the Mental Health Client Action Network, the Santa Cruz resident is looking to give back to others in need. "It's so exciting," said Blan, who first connected with the local organization at Project Homeless Connect. "I really love what happens here. Lives change." The Mental Health Client Action Network was one of more than 40 groups offering services at the fourth annual Project Homeless Connect on Tuesday at the Santa Cruz Civic Auditorium. More than 700 people attended the event for services including medical care, legal help, food and haircuts. Organizations including the Department of Veterans Affairs, Walnut Avenue Women's Health Center, Alcoholics Anonymous and Salvation Army set up booths inside and around the downtown venue in hopes of offering help for the homeless in one central area. "I love the concept of bringing the services together under one roof," said volunteer Ken Shaw. "A lot of people don't have the necessary transportation, and it can be a struggle for them." people attended this year, Lacrosse said the event was still a success. "It was a great turnout for clients," Lacrosse said. "It was 700 people that didn't get served yesterday or the day before. Even if it was 100, it'd be amazing." While the event provides basic needs such as meals, Project Homeless Connect's reach can go beyond the single day, said Marcus Kelly-Cobos, a Santa Cruz resident who has attended in years past. "I came back to what saved my life," Kelly-Cobos said. "I really just came at first for the free stuff, and I kept walking by behavioral resources thinking, 'I don't need that.'" After connecting with Janus of Santa Cruz, a local drug and alcohol treatment facility, at last year's event, though, Kelly-Cobos entered his 21st rehabilitation program and has now been sober for more than a year. He works at Janus and is in school to become a registered addictions specialist. "I'm just in the community," Kelly-Cobos said. "It helps me stay busy, and seeing what I was like when I was out there using drugs and alcohol kind of helps me stay on the straight and narrow." The event hopefully also gave the homeless community a chance to connect with the rest of Santa Cruz, Lacrosse said. City councilmen Don Lane and Micah Posner interacted with those in attendance, listening to stories of living in cars and searching for jobs, Lacrosse said. "You can just see there's a humming that's happening," Lacrosse said. "Everyone's working together." Rosaline Gustafson has been living in Capitola for 26 years. When her landlord died and the building was sold in February, she started living out of a Ford Taurus and a storage unit. The public is invited to eight upcoming sessions of a UC Santa Cruz class examining homelessness. Over the past week or so, probably the most referenced topic in our popular Letters to the Editor column has been newly installed Santa Cruz Mayor Don Lane's public statements about homelessness in the city. Dispelling myths about homeless Several recent letters to the editor criticize Mayor Lane's call to build new permanent housing for homeless individuals. SANTA CRUZ - Mayor Don Lane says the biggest step the community can take to reduce homelessness is to fund more low-cost permanent housing rather than focus primarily on providing temporary shelter, treatment programs and meals. Bud Adams says he has been homeless since the age of 12. A native of Amarillo, Texas, the 29-year-old Adams has spent more than half of his life on the streets. Why? "I've had a lot of heartbreaks in my life," Adams said.Tuesday at the Santa Cruz Civic Auditorium, Adams happily took advantage of the various services available at the second annual Project Homeless Connect Santa Cruz. SANTA CRUZ -- Life's little tasks can seem insurmountable when homeless. Fixing a bicycle, making sure the dog has enough food, accessing voicemail, seeing a doctor and getting a haircut aren't as simple for folks who don't have a car or roof over their head. The United Way of Santa Cruz County tried to lend a hand to the area's homeless Tuesday by launching Project Homeless Connect -- a one-day, one-stop shop for services that included acupuncture, banking, feet cleaning, HIV testing, animal care, mail, clothing, vision and dental care and government benefits. SANTA CRUZ "" Reading glasses, cough drops, first-aid kits "" the United Way of Santa Cruz County is still seeking basic items to meet the needs of all homeless people expected to attend its Homeless Project Connect event, scheduled for March 30 at the Santa Cruz Civic Auditorium. The one-day community-wide event is designed to provide homeless people all the resources they need in one place, said Samantha Green, volunteer coordinator at United Way. Involving a team of local agencies and more than 200 volunteers, the project is on the right track, but United Way is still looking for personal hygiene items to distribute during the event. SANTA CRUZ -- A medical check-up, dental screenings and a warm meal -- the United Way of Santa Cruz County and a team of county agencies plan to provide all of these essentials to homeless people next month for the city's first Project Homeless Connect event. 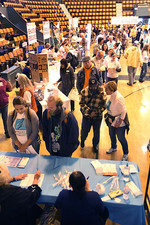 Project Homeless Connect is a one-day event that provides housing, support and quality of life resources to the homeless. The project started in San Francisco in 2004, when more than 2,000 homeless people showed up. Since then, the event have been held in more than 220 communities across the nation. Copyright © 2019, Project Homeless Connect Santa Cruz County. All rights reserved.